Professionals working together on projects and learning from others, that is what the Association of Marketing Professionals of RI is about. 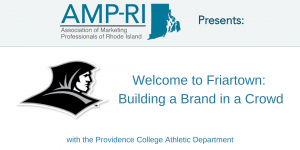 Founded in 2009, AMP-RI is an outgrowth of two earlier communications groups — the Women’s Advertising Club of Rhode Island and the Ad Club of Southeastern New England. Members of these earlier organizations have bonded with younger communication professionals to work together to create a new organization that fills the need. The monthly meetings of AMP-RI vary; some highlight expert speakers while others provide members opportunities to share ideas and create concepts with one another.